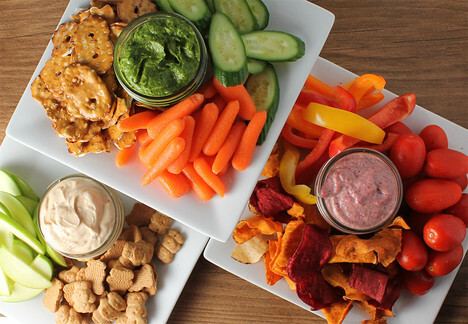 Three different savory and sweet dips for the kids to enjoy as a snack or side. In a food processor, puree the cashews until smooth. Tip: Serve with bell peppers, grape tomatoes or exotic vegetable chips. In a food processor, combine all the ingredients. Puree until smooth. Season to taste with salt and pepper. Tip: Serve with pretzel thins, baby carrots or cucumber slices. In a food processor, combine all the ingredients. Puree until smooth. Tip: Serve with apple slices, mini bear grahams or celery sticks.